Harada is a tiny 8-seater sushi counter in Ginza. It is no exaggeration when I say that it is tiny: the restaurant looks like it could fit in a large closet (I estimate it to be 5m long and 3m wide only), and guests would sit by an L-shaped counter of 4 by 5 seats, shoulder-to-shoulder. This is the reason why I did not manage to get any photos of our meal in the restaurant, because I had no space to manoeuvre my camera without knocking into the guy next to me. This restaurant is not very well known outside Tokyo, and we were given the recommendation by a friend who in turn got it from Tetsuya (the chef from the restaurant of the same name in Sydney), such that even the concierge at the Four Seasons had difficulty locating it. 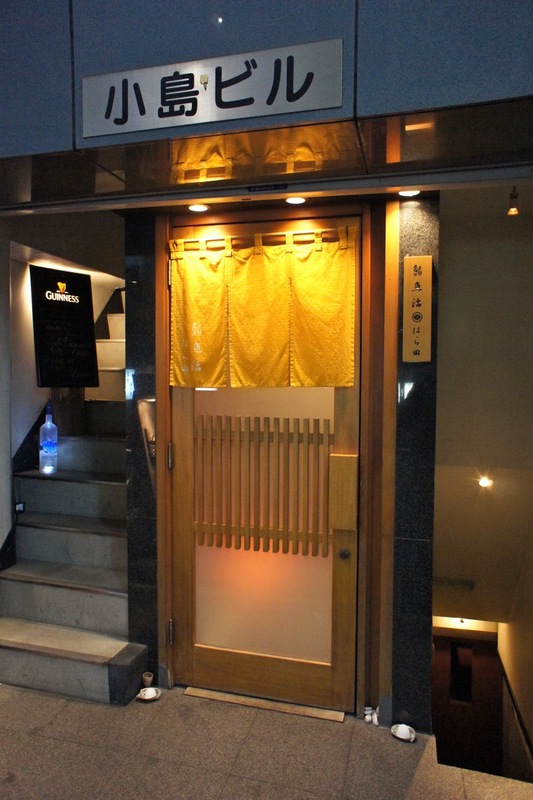 In the end, we managed to find its rather discreet entrance which was on a small street directly behind the Shiseido building in Ginza (where we had dinner the previous night - at L'Osier). The concierge had warned us that no one at the restaurant could speak English, which did not faze us, and instead we told the concierge to call the restaurant to tell them that we did not have any allergies and would eat everything. We had surprised looks from the other 7 local guests when we entered the restaurant and took our seats in the middle of the counter, and early on, it was apparent that our inability to communicate was going to be a bit of a problem. Fortunately, a middle-aged gentleman sitting next to my wife was able to speak some English and kindly agreed to help translate for the chef. Turned out that he was an ENT doctor who had been to Singapore several times (for golf) and would be at this restaurant for dinner every Wednesday night before taking the 9.30pm Shinkanzen (bullet train) to the North for his usual weekly Thursday skiing and onsen before heading back to Tokyo on Friday (what a life!). We were quite late for dinner (8.30pm) by Japanese standards, it seemed, as the guests were all already well through their dinner and were suitably drunk and rowdy. Once the chef was convinced that we would eat whatever he put our way, he proceeded to push out dish after dish of soup, sashimi and sushi. The food here was fantastic, and after a starter of clear soup, we had a procession of otoro (tuna belly) sashimi, shredded crab meat, negitoro (minced tuna belly), tai (seabreem) sushi, akagai (ark shell) sushi, large ikura (fish eggs) in a bowl of rice, hotate (scallop) sushi and amazingly fresh uni (sea urchin) on a bed of roasted rice in a scallop shell, amongst other dishes which we did not recognise. We ended dinner totally stuffed and to keep us warm before we walked out into the cold, we were served a large bowl of fish soup. The chef was very friendly, and despite our inability to communicate (his English was better than our Japanese, which isn't saying much), he still kept trying to have a conversation with us after all the other guests had left. It turned out that this restaurant sees mostly regulars who are locals, and he knows only one other Singaporean diner ('Chan', he recalled and he seemed to think we would know who a person called 'Chan' is). He was particularly thrilled that amidst the hundreds of sushi restaurants in Ginza, we had chosen to eat at his. The food was very good and the meal was reasonably priced for an omakase sushi counter (omakase meaning that you leave the choice of food to the chef). We would highly recommend it (and please mention to the chef the Singaporean couple who recommended it - although the local regulars would be dismayed to find foreigners invading their joint). Indeed , you have made a good choice to dine at Harada-san's restaurant. His warm approach is very unique amongst the Japanese. Thank you, we had an amazing time there..
Am travelling to Tokyo in Dec, however I couldn't find much info online about Harada. May I know how much did the meal cost per pax? And would it be difficult to get a table if I make a reservation only when I land in Tokyo (ie. 2 days in advance) as my travel plans are not confirmed yet? It was a long time ago, but I seem to recall the meal costing about Y15,000 to Y20,000 per head. The place is really small, so trying to get a seat there at the last minute could be tricky.